Monday is the deadline for businesses to send out some major tax forms, so make sure you’ve got your shop’s books in order and keep the Internal Revenue Service happy. This list is only meant to cover common items due over the course of a year for a collision repair shop. It’s by no means exhaustive of everything your business should do over the year, and it’s a federal-level guide only. We’d encourage any business to a) use the interactive IRS Tax Calendar for Businesses and Self-Employed, the hard-copy Publication 509 calendar (this was the easiest to wade through, in our opinion), and this overview of 509; and b) talk to an accountant. Some small employers might have different dates apply to them that aren’t on this list (for example, when to deposit undeposited taxes) or not be affected by some of these deadlines; check Publication 509 or talk to an accountant for more details. That out of the way, here are some looming and future tax deadlines for your collision repair operation. Feb. 2: There’s a few forms that a business might need to send out today, but the perhaps most crucial one is the W-2 showing what you paid your employees in 2014. Some businesses might also need to provide recipients of other types of income (such as freelance contractors) with 1099s. Notices of some 1099 payments, such as settlement payments to attorneys, aren’t due until Feb. 17. For more on what’s due on what 1099 date, check with the calendars above, the form itself, and your accountant. Feb. 2: If you haven’t filed your taxes already for these forms, file Forms 940 (federal unemployment tax), 941 or 944 (withheld income tax, Medicare and Social Security for your employees; your business’ size will determine which form), and 945 (tax withheld on nonpayroll items). Feb. 10: If you did already pay taxes on Forms 940, 941/944, and 945, you don’t have to get the paperwork in until Feb. 10. Feb. 17: Notices of some 1099 payments, such as settlement payments to attorneys, are due. For more on what’s due on what 1099 date, check with the calendars above, the form itself, and your accountant. Feb. 17: Pay nonpayroll withholding, withheld income tax, Medicare and Social Security for January if you’re on the monthly deposit rule. Feb. 18: Start withholding for any employees who didn’t file a W-4 exemption for 2015. March 2: File your 1099s and various other payment-to-others related forms like it as well as your 1096 (which sums up what’s on the other forms) with the IRS. If you e-file, the 1096 isn’t needed and you get until March 31 to turn them in. March 2: File your W-3s and W-2s with the IRS. 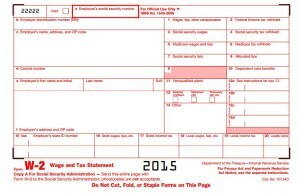 If you e-file, you get until March 31 to turn in your W-2s and don’t need a W-3. March 16: Deadline for some corporations to file their tax return and pay up. March 16: Pay nonpayroll withholding, withheld income tax, Medicare and Social Security for February if you’re on the monthly deposit rule. March 31: Deadline to e-file your 1099s and various other payment-to-others related forms like it with the IRS. March 31: Deadline to file your W-2s electronically. April 15: Date for other types of businesses to file their tax returns and pay up. April 15: Date for corporations to deposit first part of estimated 2015 tax. Form 1120-W can help with these projections. April 15: Pay nonpayroll withholding, withheld income tax, Medicare and Social Security for March if you’re on the monthly deposit rule. April 30: File Form 941 (withheld income tax, Medicare and Social Security) for the first quarter of 2015 and pay up/deposit whatever’s left if you haven’t already. You have until May 11 to file this if you deposited in full and on time. April 30: Pay federal unemployment tax through March. May 11: File Form 941 (withheld income tax, Medicare and Social Security) for the first quarter of 2015 if you’ve already deposited everything on time. May 15: Pay nonpayroll withholding, withheld income tax, Medicare and Social Security for April if you’re on the monthly deposit rule. June 15: Date for corporations to deposit second part of estimated 2015 tax. June 15: Pay nonpayroll withholding, withheld income tax, Medicare and Social Security for May if you’re on the monthly deposit rule. July 15: Pay nonpayroll withholding, withheld income tax, Medicare and Social Security for June if you’re on the monthly deposit rule. July 31: File Form 941 (withheld income tax, Medicare and Social Security) for the second quarter of 2015 and pay up/deposit whatever’s left if you haven’t already. You have until Aug. 10 to file this if you’ve already deposited in full and on time. July 31: Pay federal unemployment tax through June. Aug. 10: File Form 941 (withheld income tax, Medicare and Social Security) for the second quarter of 2015 if you’ve already deposited everything on time. Aug. 17: Pay nonpayroll withholding, withheld income tax, Medicare and Social Security for July if you’re on the monthly deposit rule. Sept. 15: Date for certain businesses which received an extension in March or April to file a tax return and pay up. Sept. 15: Date for corporations to deposit third part of estimated 2015 tax. Sept. 15: Pay nonpayroll withholding, withheld income tax, Medicare and Social Security for August if you’re on the monthly deposit rule. Oct. 15: Pay nonpayroll withholding, withheld income tax, Medicare and Social Security for September if you’re on the monthly deposit rule. November: Ask employees who anticipate a different withholding allowance in 2016 (for example, they just got married) to fill out a new W-4. Nov. 2: File Form 941 (withheld income tax, Medicare and Social Security) for the third quarter of 2015 and pay up/deposit whatever’s left if you haven’t already. You have until Nov. 10 to file this if you’ve already deposited in full and on time. Nov. 2: Pay federal unemployment tax through September. Nov. 10: File Form 941 (withheld income tax, Medicare and Social Security) for the third quarter of 2015 if you’ve already deposited everything on time. Nov. 16: Pay nonpayroll withholding, withheld income tax, Medicare and Social Security for October if you’re on the monthly deposit rule. Dec. 15: Date for corporations to deposit fourth part of estimated 2015 tax. Dec. 15: Pay nonpayroll withholding, withheld income tax, Medicare and Social Security for November if you’re on the monthly deposit rule.